In this new book from the Dalai Lama, the reader will discover the mind’s infinitely vast potential, its buddha nature. Knowledge of buddha nature reveals and reconciles the paradox of how the mind can be the basis for both the duhkha of samsara (the unpurified mind) and the bliss and fulfillment of nirvana (the purified mind). 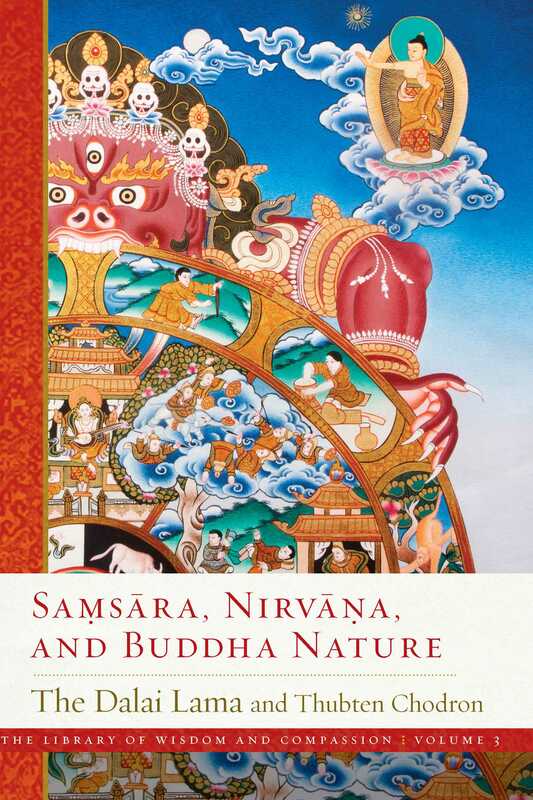 To illustrate this, Samsara, Nirvana, and Buddha Nature first takes readers through Buddhist thought on the self, the four truths, and their sixteen attributes. It then explains afflictions—including how they arise and their antidotes—followed by an examination of karma and cyclic existence, and, finally, a deep and thorough elucidation of buddha nature. Samsara, Nirvana, and Buddha Nature shows us how to purify our minds and cultivate awakened qualities. This is the third volume in the Dalai Lama’s definitive and comprehensive series on the stages of the Buddhist path, The Library of Wisdom and Compassion. Volume 1, Approaching the Buddhist Path, contains introductory material that sets the context for Buddhist practice. Volume 2, The Foundation of Buddhist Practice, describes the important teachings that help us establish a flourishing Dharma practice. Samsara, Nirvana, and Buddha Nature can be read as the logical next step in this series or enjoyed on its own.